Wild-type or “normal grey” cockatiels are mostly dark-grey in color, with a white bar on the outer-wings. They are the only long-tailed species of cockatoo. Both males and females have a prominent erectile crest and yellow face with orange cheek patches – the male’s being much brighter in color. Females have yellow and grey striped outer tail feathers. Juveniles of both sexes have female coloring, and are impossible to visually tell apart until about 6 months of age. Over a dozen color mutations currently exist in captivity, including lutino, pied, pearl, cinnamon, fallow, and whiteface. Some mutations make it difficult to tell even adult males and females apart. All color variations of cockatiels are beautiful, and there is no difference in cockatiel behavior between the mutations — although normal grey cockatiels are said to be generally more robust and hardy. Cockatiels are very charming, gentle parrots, and are quite suited to living as pets – especially compared to their louder, larger cousins. I have had cockatiels in my life for the past 16 years, and honestly couldn’t imagine life without them! Overall, ‘tiels are ideal for first-time bird owners. They are very playful and affectionate, and surprisingly loyal to a dedicated owner. They have strong personalities, however, and require consistent socialization to prevent bonding to only one person. Both males and females are great companions: the males tend to be more vocal, and have a knack for mimicking sounds, and even human speech, while the females are quieter overall. These birds are very intelligent and can be taught tricks as well, such as step-up, recall, and wave. Unless kept in an aviary with other cockatiels, they do require a minimum of one hour daily outside their cage to socialize and exercise. Cockatiels are wild animals. Their strong prey instincts are very much intact, meaning they can be unpredictable at times, and may not be suitable for some small children. 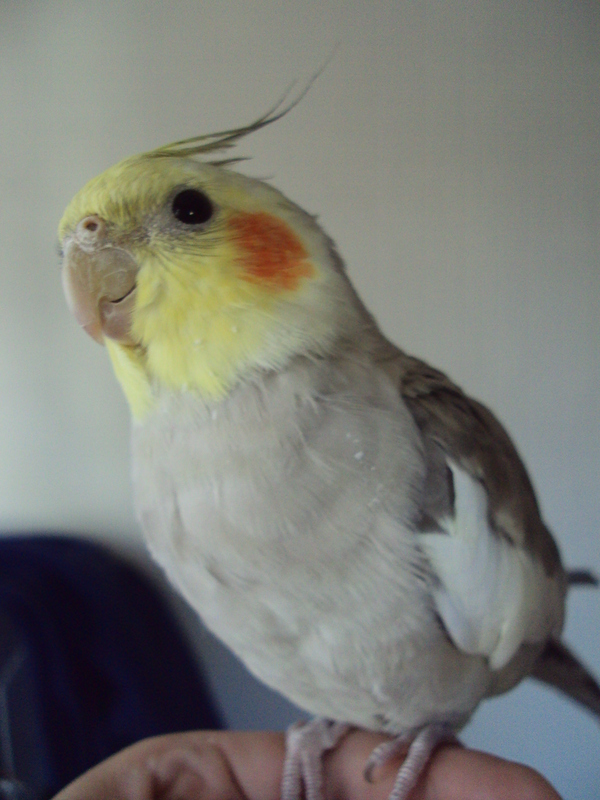 A frightened cockatiel that feels cornered or restrained, even when socialized, is likely to bite. Hard. Cockatiels are often stressed by loud, excitable kids, but can do very well with a calm or older child. Cockatiels require specialized vet care. The anatomy of birds is so different from that of mammals that only certified avian veterinarians are qualified to care for them, and avian vets can be expensive and hard to find. Cockatiels, like dogs and cats, need yearly checkups with their vet. And remember: cockatiels will always hide any illness for as long as possible — and they are good at it. If your bird appears sick, get it to a vet ASAP! Chances are, your bird is gravely ill and you don’t have much time to save them. Cockatiels can be messy and time-consuming. They delight in throwing food around, and produce a powdery down that coats their feathers and everything else in the room, which causes allergies in some people. Cleaning and caring for cockatiels requires daily work — and don’t forget, these birds can live a long time! In the wild, cockatiels subsist on grass seeds, nuts, flowers, insects, and sprouts. In captivity, cockatiels need a varied diet consisting of quality seeds, pellets, vegetables, and grains to stay healthy. Poor diet severely shortens the life of pet cockatiels, and causes many health problems. These birds can eat just about any fresh, natural food that we humans can, within reason, EXCEPT for: chocolate, caffeine, alchohol, fatty/salty foods, and avocado. Other foods can make our birds sick as well. Click here for a more exhaustive list. For their safety and security, all pet cockatiels need a large, quality cage. Bigger is always better for these active birds, but the MINIMUM measurements should be 20x20x26in with a maximum bar spacing of 3/4in. Cockatiels need several different sizes and types of perches in their cage to keep their feet healthy, as well as a recommended minimum of three toys for mental stimulation. Cockatiels should always have access to fresh water and food that’s changed at least once daily, and the cage itself must be cleaned on a regular basis. Choosing to share your life with a cockatiel is a big decision — these birds are a long-term commitment, and their specialized needs means that they are not suited for all households. But for the right family, caring and bonding with cockatiels is a very rewarding experience! You will have a hard time finding a more delightful pet to share your life with! The National Cockatiel Society website has excellent articles on cockatiel care, with beautiful photos of cockatiel mutations. The Association of Avian Veterinarians website can help you find an avian vet in your area, and is full of bird care information. Remember, I am not a trained professional, and highly recommend that cockatiel owners, or potential cockatiel owners, contact a certified avian vet for questions regarding cockatiel health. The ASPCA bird safety tips page offers more in-depth information on household dangers. They also offer this list of poisonous plants. (Keep in mind that some other info listed in this website pertains to dogs and cats, and is not necessarily applicable to birds). The Internet Bird Collection has good info on wild cockatiels, including video and pictures. It is incredible to see flocks of these birds in flight! really great stuff. I own 3 cockatiels and everything this article is saying is right on. Especially them creating film on wings, leading to dust and allergies. I created an atrium, large-outdoor-cage, just outside my window. The birds love it, and I do too. In the morning I let them out to groom themselves. They love it in the rain because they can go to the far perch, fluff up and get splashed with fresh falling rainwater. Or they will take turns being Alpha: One male going nuts with vocals for 10 minutes for each male, while the females fluff up and close their eyes, enjoying the males songs. Then they come in to eat and socialize. Just like what was written above, They whistle or chirp when a bird or human leave the “flock”.